I hope spring is in the air where you live and you’re enjoying every moment of it. Unfortunately here in Michigan it’s only in the upper 30’s and we’ve had snow for the first day of spring. I’ve heard the birds chirping, so I know our spring weather is just around the corner. After so many months of winter, the anticipation of warmer weather and flowers always prompts me to start decorating our house for spring, even though we might have cold and snow outside. 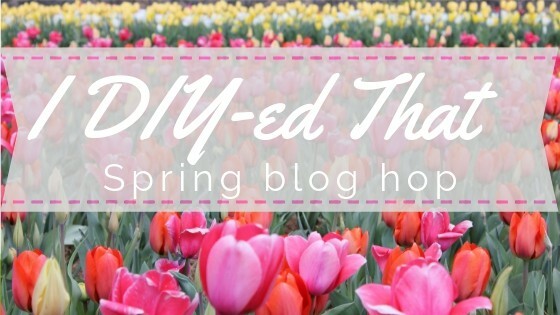 Today I’m joining up with some amazing bloggers for I DIY’ed That Spring Blog Hop. My friend Jen, from Noting Grace has graciously organized this blog hop to get everyone inspired for spring. If you don’t already know her, make sure to stop over and see her lovely home. If you’re coming here from Cuter Tudor, “WELCOME”! One of the simplest and easiest ways to bring spring inside your home, other than fresh flowers of course, is to freshen up your mantel or the top of a buffet or console table for spring. Unfortunately, we don’t have a real fireplace mantel, but we do have the next best thing. It’s a beautiful 4 ft. floating shelf we bought a few years ago from Pottery Barn. When I think of spring, I think of green leaves and grass, flowers, birds and warm weather. So every year I put out my pot of faux grass. Whenever I buy faux flowers, I try to buy the ones that looks so real. The same was true with this grass I bought a few years ago. Most faux grass I looked at looked so fake, but I found the one above at a local garden store, but the only issue it had was the cheap looking black pot. I have lots of burlap around our house, so I cut a strip to wrap around this pot. I started out by laying the pot on it’s side and just rolled it. I put a dab of glue on the back of the pot to hold the burlap in place, then when finished rolling it, I tucked the raw edge in and glued it in place. I already had this white ribbon, so again I put a dab of glue on the back to help hold it in place. No more cheap-looking plastic pot! Isn’t this cute with the ribbon and the burlap…I love it! I bought the above tulips at one of my favorite store, Kennedy’s Flowers and Gifts. In fact, this was the only thing new I bought for this year. I also used my unfinished birdhouse I bought years ago. At least I primed it, even if I never ended up painting it. At one time I was a Longaberger sales consultant. Although I’ve sold most of my baskets, I also kept a few of the ones I really liked. The above one was sold for either spring or a Mother’s Day gift and I decided to use it this year as a gathering basket for flowers. Old windows are perfect for hanging on the wall or on top of mantels. This one I purchased without any glass and it’s been perfect for decorating with. So this is our spring mantel for this year. Our mantel for 2016. BTY, the yellow daffodils came from The Dollar Tree and surprisingly look real. Before you leave, please make sure to visit The Honeycomb Home to see her cute spring place setting idea. There’s also lots of inspiration in the blogs listed below. Carol - this is so very pretty - a perfect way to usher in the new season! I am so glad you joined us for I DIYed that! I'm honored you did! Have a great Thursday! I love your mantel Carol...and thanks for sharing your previous years for a good prospective. Using the burlap on your little pot of greenery is perfect as it ties in the basket and window frame and I would be remiss if I didn't comment on the beautiful tulips. What great ideas! I love all the greenery and pretty flowers. Its perfect for spring. That's such a genius way to disguise a plain pot! I really appreciated that you included the previous year's worth of mantel ideas too. Seeing the same elements show up on different years, sometimes spaced out over a couple years, really helped me rethink some things I have to reuse in a new way. I also love the simplicity of your groupings, not too over crowded. And as much as I like all the elements; vases, florals, and figurines....I think I like the window frame the best as the anchor. That I don't have, and now I need to shop for that because my brain just popped with ideas to use incorporating that, woo!